I couldn’t stop laughing for two reasons. One, he called it “slice” and it was adorable. And two, he didn’t have any bugs or eggs in his hair, and I was so relieved. It put me in the best mood ever. When you aren’t experienced with the lice game, it all sounds really scary. 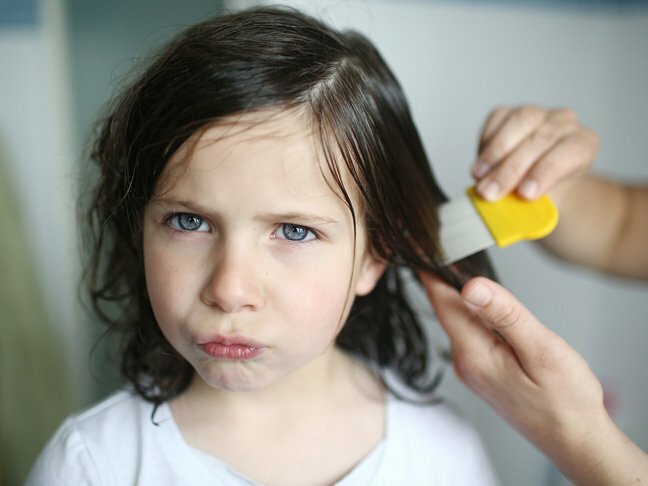 As the years passed, there were around six lice notices between my three elementary school-aged kids, but no lice were to be found. But alas, one evening the spell was broken when my daughter came downstairs after I’d tucked her in hours before — not something she regularly did. She was scratching her neck. It was really late and I couldn’t believe she hadn’t fallen asleep yet. She told me her head was really itchy, so I checked it out. I didn’t see a thing except for a few bites on her neck and ears (the first sign of lice, unbeknownst to me). No notices had been sent home from school, either. I chalked it up to her having some spider bites, then sent her back to bed. Not having dealt with lice before, I had no idea what to look for, but I was positive she did not have that. Then I got a call from the school nurse the next day telling me that my daughter found a bug in her hair and she did, in fact, have lice. “It’s a very mild case and you don’t have to come get her, just get some Nix tonight and she’ll be fine to come back to school tomorrow,” she said. I was pulled over on the side of the road to take the call, and I literally started panicking at that very moment. I was sure I felt bugs jumping on me, and my skin started to crawl. My head was itching like crazy. I was positive I had gotten “the slice,” too. I started scratching and couldn’t stop. Then my eyelashes and eye brows started itching. Then my lady bits felt like they were on fire. Surely, the lice had snuck down to my special place and I needed to jump in the shower and burn everything we owned. Clearly, I was a mess. I spent the rest of the afternoon and evening cleaning and bagging everything we had after spending almost $100 on lice-removing sh*t. Everything got washed, or thrown out, or vacuumed to death. I think I did the sofa and chairs three times. I was on a rampage and didn’t stop until almost 2 a.m. the next morning. After treating all three of my kids to a Nix bath right after school, I checked their heads. Then again before bed. Then again in their sleep. I was exhausted but I couldn’t stop. I was on a mission to make every damn louse that dared enter my house very, very sorry. When I woke up the next morning to find my daughter had crawled into bed with me that night, I thought I felt some jumping on my nose. I hopped in the shower and treated my head again. It was at that moment that I realised I needed to calm the hell down. I was losing it. These were just bugs, after all. People get lice all the time. My kids did not need to see me in this state over a few bugs. But I couldn’t help myself. We got rid of “the slice” that year and were in the clear for about five years after that episode. We just suffered through another round this fall and I acted the exact same way. The truth is, when you have a child with bugs crawling on her head, you have no chill. You go a little berserk. If you don’t have OCD already, you get it. You constantly check the child’s head, your head, your pubic hair, the pillows, and stuffed animals. You don’t relax. Not even a little bit. I know they are just bugs, but they are bugs who are using you or a loved one as a host, and you are going to freak out until they all die. There is no way around it.